The holidays are over, yet Spring is still weeks (months!) away for most of us — and so millions of Americans may be dealing with Seasonal Affective Disorder (SAD). This form of depression can be serious for some, but most suffer from a mild version of SAD, feeling out of sorts, more tired than normal, and even grumpy. Doctors have learned that SAD can be triggered by the lower amount of sunlight many of us receive in the winter—and indeed, SAD is more common the farther north you live. Watch the basics: In the shorter days of winter, it’s easy to put off exercising, for instance. But staying on track with eating healthy, sleeping well, and exercising regularly really pay off. If you need a workout app to remind you to stay on track, check out the ones we looked at recently. Stay connected: Building stronger social connections helps you stay positive. Set a time to Facetime, Skype, or hold a Google Hangout with a friend or loved one you haven’t seen in a while. Even online, seeing each other and having a real conversation feels a lot more personal than sending a text here and there. Light up your life: If you have trouble getting started in the morning, a Phillips Wake-Up Light might give your day a better start, gently raising the light level in your room until you’re awake. 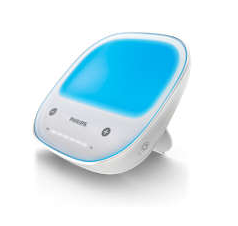 Many doctors recommend light therapy for SAD, and using a Phillips goLITE BLU device for a few minutes in the morning can make a real difference throughout your day. Check out the Phillips site for more research on how light impacts our moods. Find something to celebrate: Finally, remember that some things only happen in winter. Make a note each day about something unique you saw: The first snow of the season…the first slush of winter…the first crocus poking up to remind us spring is on the way. Winter’s the best time of the year to make soup, or to snuggle up and watch a movie at home instead of going out. And don’t forget, from here on out, the days will only get longer!